This past week in hockey had some significant developments in the standings, as well as some controversial events. The standings are ever-changing, in this week’s Week in Review. The division leading Pittsburgh Penguins had an up-and-down week, crushing the San Jose Sharks 5-1, but losing to the Boston Bruins in a bitter rivalry turned dirty game 3-2. In the process, defensive stalwart Brooks Orpik was carted off the ice, and James Neal is awaiting a suspension in a similar event, but more on that later in the post. The Washington Capitals remained just 7 points back, also taking a 2-1-0 week by thrashing the Nashville Predators and the New York Rangers. Speaking of the Blue-shirts, the Rangers had a tough week, taking 3 points out of 4 games, losing division matchups to the Devils and Capitals, and only beating the bottom-feeding Sabres. They are now tied with the Carolina Hurricanes, who have set up a nice 3 game win streak, with strong play from Cam Ward and rookie Elias Lindholm. 1 point behind those two are the New Jersey Devils, who still have random outbursts as well as random lulls. The Devils lost the first 3 games of the week, taking 1 point out of 2 games against surging Montreal, then coming from behind to beat the Rangers in OT. The Devils have needed to dig into their AHL roster, and have seen success in them so far. The Philadelphia Flyers are hanging around, and are even more baffling than the Devils, crushing one night, then looking hopeless the next. They remain 1 point ahead of the Columbus Blue Jackets, who have started to win a few big games recently. The Islanders haven’t won since Nam, with their streak extended to 9 games without a win, and continue to be one of the league’s biggest busts. Seeds 2-7 in the Metro are separated by just 7 points, and the shuffle continues from here on out. The Boston Bruins have lost most of their division lead this week, and it had nothing to do with their play. They won 2 of their 3 games, against decent opponents in Pittsburgh and Toronto. But their one loss came against the bleu-blanc-et-rouge hot team, the Montreal Canadiens. The Habs, winners of 4 this week and 5 straight, swept the Devils in a home-and-home, and beat the Bruins in a showdown Thursday night 2-1, climbing within 1 point of the lead in the Atlantic. Both of those teams are trying to pull away from teams like pesky Detroit. The Red Wings went 1-2-0 this week, beating the Devils, but losing to the Flyers and Panthers, teams they should beat, and are now 4 back of Montreal and 5 from Boston. Tampa continues to fall through the standings, only winning 1 of 3 games this week, but received good news from Steven Stamkos, who plans a return soon after the Olympic break. The Lightning just have to hold on until he gets back in order to contend for the playoffs. Another team that’s been falling have been the Maple Leafs, who took 2 of 4 this week, but remain far from the top, and have not played well against better sides. They do remain in the second wild card, 4 points ahead of Carolina/New York Rangers, however. Ottawa is stopping the flailing, but they haven’t been winning enough games to get back in the hunt, now 8 points back of Toronto after a tough week. The Florida Panthers seem to win random games, with no rhyme or reason behind it, and remain way behind most teams. The Sabres played twice and lost twice, what else is new? 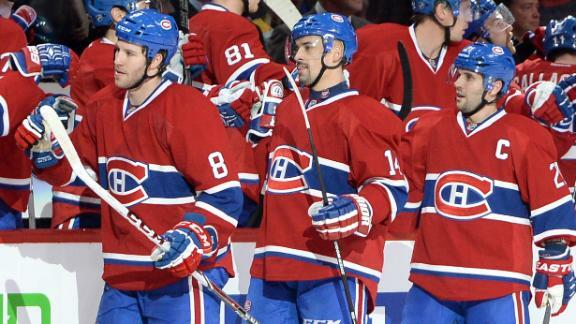 The Canadiens caught fire, but can it continue into the next few games? We shall see coming up soon. The Blackhawks actually lost 3 in a row this week (gasp!) before pommeling the Panthers Sunday night, and remain well ahead of anyone in the division. Their 21 wins and 47 points both still lead the league. The St. Louis Blues, however, have played 4 fewer games than Chicago. The Blues took just 1 of 3 games this week, and missed a golden opportunity to gain ground on the ‘Hawks, but still are within range. The Minnesota Wild are now tied with the Blues, after 3 home wins and a road loss this week. The Wild are nearly unstoppable at their home rink, and have passed the Avalanche, who took 1 of 3 this week in Western Canada, including an embarrassing 8-2 loss to the Oilers. The Avalanche seem to be coming back down to earth after an unreal start to the season, having one of the best records at the quarterpole, while the Wild are heating up again, and starting to prove that they have the team to compete this year. The Dallas Stars have been creeping up, taking 5 of 6 possible points this week in big wins against Chicago and Philadelphia, and are now just 7 back of the Avalanche. The Winnipeg Jets also remain somewhat alive, taking 2 of 3 this week, but have a bigger hill to climb, having played more games. The Nashville Predators lost all 3 this week, and are becoming destined for another lottery pick. This division has been tightening up, and will get more interesting with the current trends as the season continues. The division lead continues to be switching between the San Jose Sharks and the Anaheim [Mighty] Ducks every week. This week, it belongs in So-Cal. The [Mighty] Ducks got 5 of 6 points, beating Chicago and St. Louis in big games, while the Sharks hit another soft spot, losing 3 straight after beating Toronto, including losses to Pittsburgh, Carolina, and Minnesota. It wouldn’t shock anyone if the [Mighty] Ducks continue to win, and the Sharks continue to struggle, or if they again swap positions by this time next week. The Los Angeles Kings have something to say on the matter, winning 3 this week and getting points in 9 of their previous 10 games to pull within a point of the Sharks, further changing the scope of things. Vancouver also won all 3 of their games this week, making 4 straight, and are pulling back into contention. The Canucks are now just 6 behind Anaheim, and took the 4 spot in the division away from the plummeting Phoenix Coyotes, who took 1 of 3 in Western Canada to fall back to 5th place, 2 behind Vancouver. They have been struggling recently, but look to get back into the swing of things when they return home to the desert. The Calgary Flames had 2 wins this week, and it seems like a while since they’ve done that. The Edmonton Oilers have gotten crushed and also crushed this week, showing that their offense is potent, but their defense is still a huge question mark. It seems this division turns to whoever is playing on home ice for the time, as the top 5 teams are a combined 46-12-11 at their respective home rink. 1) Anaheim [Mighty] Ducks – Though it took a shootout, they beat the Blackhawks this week. They are still without regulation loss at the Pond, also. Tops for me this week. 2) Chicago Blackhawks – I know they hit a 3 game slide this week, but that says more for them because they still lead the President’s Trophy race. 3) Los Angeles Kings – Ben Scrivens has stepped up big time in the absence of Jonathan Quick. This gives the Kings time to make sure their top guy is ready to come back at 100%. 4) Montreal Canadiens – Red hot play from everyone lately, and the group of Brendan Gallagher, Alex Galchenyuk, P.K. Subban, and others are looking to overthrow the Bruins in the Atlantic. 5) Minnnesota Wild – The Xcel Energy Center has been a safe haven for them so far, but their road woes continue to question their stability. I see it getting fixed soon. Rinaldo got 2 for instigating, 5 for fighting, 10 minute misconduct and a game misconduct. It led to a 7 minute power play for Dallas. At least Roussel got up from that one. In our other case, a series of cheap shots exchanged Saturday night in Boston led to a small scrum between the Penguins and Bruins. Shawn Thornton took exception to a hit Brooks Orpik landed on poor Loui Eriksson, and gave him the business. This time, though, it ended worse. Thornton slew-footed Orpik, followed by a couple of punches to the head. Orpik was out cold, and was subsequently stretchered off the ice. Thornton does have a bit of a history, but this one involves injury. He has a hearing coming up, and a well deserved suspension soon there after. Stay tuned this week for some more action on the ice. See you then, puck-heads!